Planning officers have recommended revised plans to transform a former Co-op site into a Lidl supermarket be approved, as it heads to planning committee more than a year on since the first application was rejected. The application for the site on Chain Lane will go before the Committee on Tuesday July, 25 after a series of changes since it's first conception in March, 2016. Existing structures will be demolished for a new one storey building, car parking and the land is to be raised by 1.5m to improve pedestrian and vehicle access. Changes to the plan have included a move away from a two story building, reduction in the amount of window glazing at the front of the store and an increase to the amount of brickwork to allow the building to suit the surrounding area. 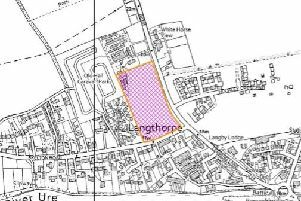 However Knaresborough Town Council remain concerned at this version of the plans, Mayor's consort and Coun Andrew Willoughby highlighted the difficult decision ahead. He said that some residents could still be affected by increasing noise levels from deliveries and use of the car park. Coun Willoughby said: "It's a difficult one as people in Knaresborough are clamouring for it, they are complaining about the site in its current state with it being untidy and how the other Lidl store is overcrowded. "However Lidl has made little effort to improve the plans, they have done some work, but we still have some houses where gardens will be affected by the car park being on level with them. A few inches makes all the difference." He added: "On the one hand something like the loading bay may make a lot of noise but many of these issues we will not know for sure about until it's built. Why we need to be careful though is that while people are saying lets get it built there are still people whose lives could be ruined by this." Planning documents state that the Lidl site will include a 2.4 m acoustic fence in place near the loading bay to help reduce the noise created by the delivery trucks, officers also noted no issues would be raised if deliveries were restricted to 8 am to 9pm, Monday to Saturday and 9am to 5pm on Sundays. The supermarket chain said the new site would be an improvement on its current store on York Road.